Practical, theoretical, global: provides thorough grounding in economic and international business theory complemented by cases, examples, and IB insights from a diverse range of companies and cultures. 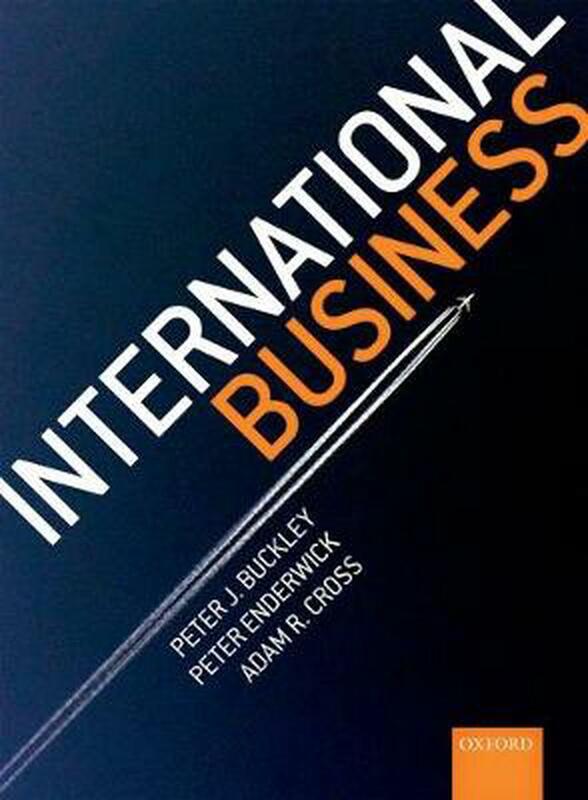 In this brand new textbook, Peter J. Buckley, Peter Enderwick, and Adam R. Cross bring a wealth of experience and a truly global approach to the study of international business. A thorough grounding in economic and international business theory is complemented by examples and extended cases from six continents.The Global Factory framework, developed by Peter J. Buckley, is used throughout the book to form an overarching, coherent and accessible model for understanding how businesses operate globally. The framework brings together economics and other perspectives, including social anthropology, political economy, and management, to explain how international businesses integrate to produce goods and services, and places international business theories firmly in their global context.An international range of examples and extended cases link theory to management practices throughout, preparing students for the challenges faced in the real world of business. Engaging examples include internationally-recognised multi-national enterprises such as Apple, Airbnb, and Uber, as well as companies from emerging markets such as Laos, Brazil, and Ethiopia.Opening cases discuss real challenges confronted by international businesses and invite students to devise their own solutions. Closing cases and IB Insights allow students to engage and reflect on international business practices at real, global companies.Additional learning features include Topics for Debate, which encourage students to view international business through a critical lens, and Research Insights, which provide commentary on seminal international business research, and introduce students to key scholarship. Peter J. Buckley is Professor of International Business, Founder Director of the Business Confucius Institute, and Founder Director of the Centre for International Business, University of Leeds, UK. He is a Fellow of AIB, BAM, EIBA, the Academy of Social Sciences, and Fellow of the Royal Society of Arts (RSA). He was President of the Academy of International Business from 2002 to 2004 and Chair of the European International Business Academy from 2009 to 2012. He was appointed Officer of the Order of the British Empire (OBE) in 2012 for services to higher education, international business and research, and elected a Fellow of the British Academy (FBA) in 2014. Peter Enderwick is a specialist in the field of international business. He is currently Professor of International Business at AUT University, Auckland, New Zealand. Between 1988 and 2004 he was Professor of International Management at the University of Waikato, Hamilton. He has held visiting positions at the Helsinki School of Economics and Business, Finland, the University of South Australia, Adelaide, Thammasat Business School, Bangkok and the Centre for International Business, University of Leeds. His research interests are in globalisation and labour, service sector multinationals, and large emerging markets, particularly China and India. Adam R. Cross is Professor of International Business and Associate Dean for Learning and Teaching at International Business School Suzhou (IBSS), Xi'an Jiaotong-Liverpool University (XJTLU). From 1996 to 2013 he worked in the Centre for International Business, University of Leeds (CIBUL). He has co-edited three books, and has contributed to more than thirty five book chapters and articles in internationally refereed journals, including Journal of International Business Studies, Journal of World Business, International Business Review, and Management International Review. His research focuses on the internationalisation of Asian multinational firms, and the cross-border licensing and management of intellectual property.